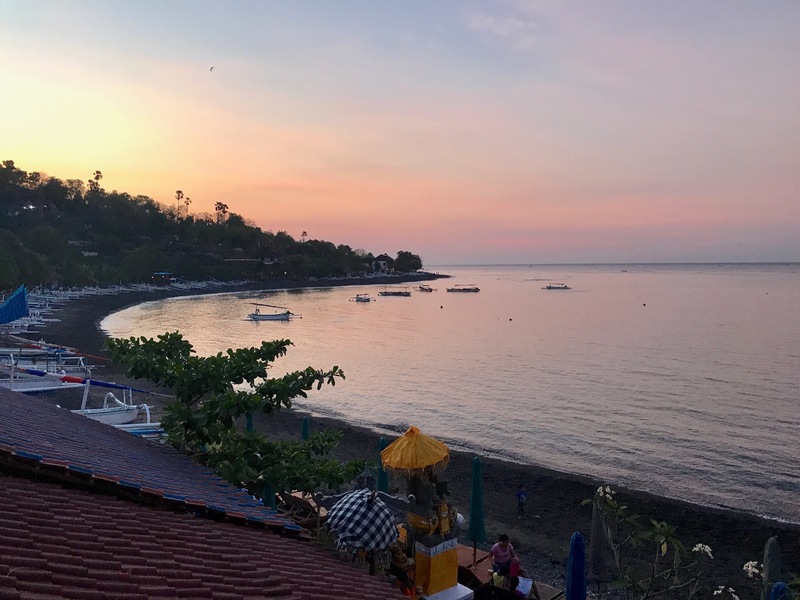 I had to go back to Denpasar to keep going through the Visa process at immigrations. Luckily, I spent less than 5 minutes in the immigrations building, had my fingerprints and my photo taken and the rest of the day was for adventure. 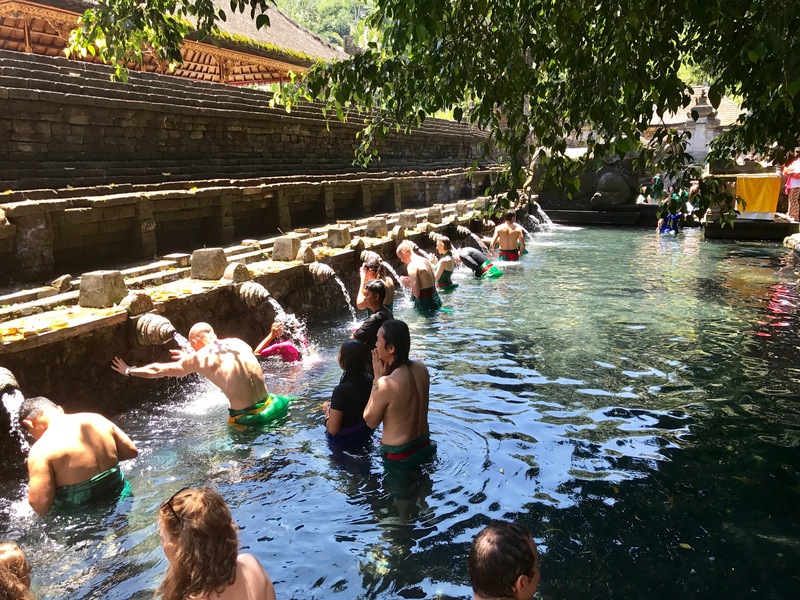 Our first stop was Tirta Empul. 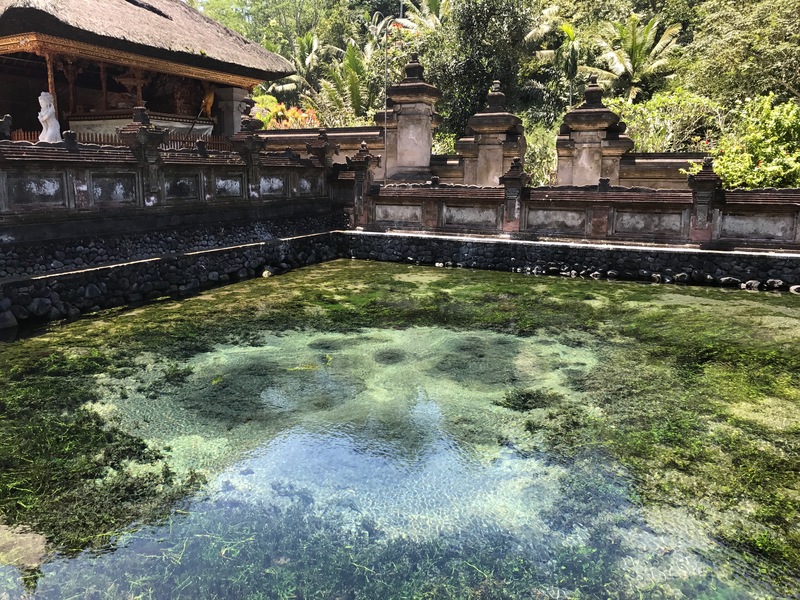 This is a picture of a holy water pool – it was so fascinating watching the bubbling water. It was so clear and pristine. You can walk into a large pool and bathe yourself in this holy water. I didn’t do the cleansing this time because there were so many people and I can’t tell you how many people were standing in large groups taking pictures and selfies everywhere I looked. I wasn’t in the right headspace to really feel the intention of the cleansing. I’d love to go back on an early morning when it is quieter and a bit slower. Really take my time with it. Next stop was brunch. 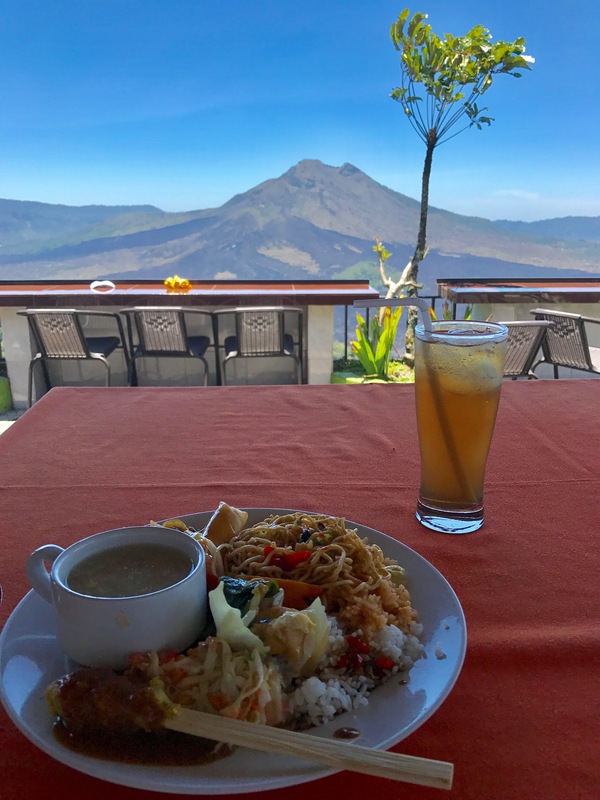 An all-you-can eat buffet…with the most incredible view of Mt. Batur. Mt. 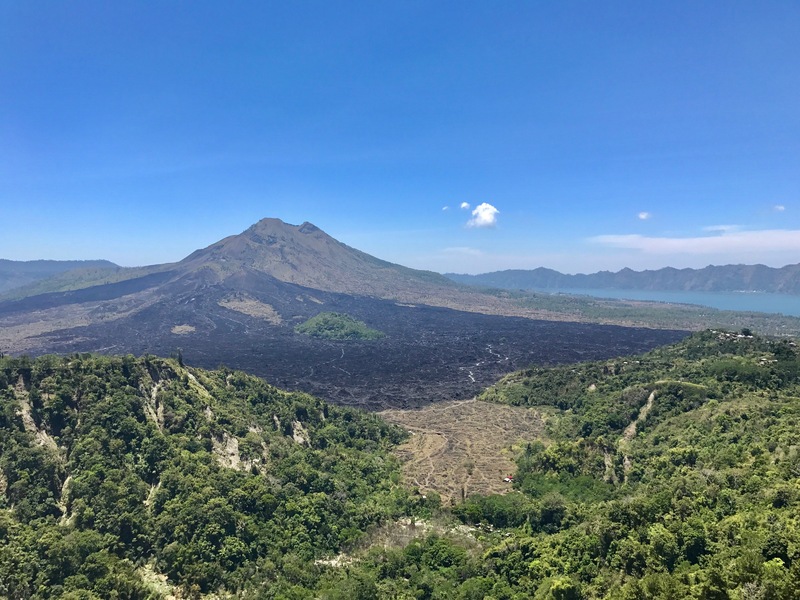 Batur is a smaller volcano on Bali that last erupted in 2000. It was amazing seeing the scars of the lava from way back when. One of the most memorable and delicious lunches I’ve ever had. In the afternoon, we drove along a road that I don’t think any tourists go on. When the locals saw me, they looked at me like they had never seen a white person before. 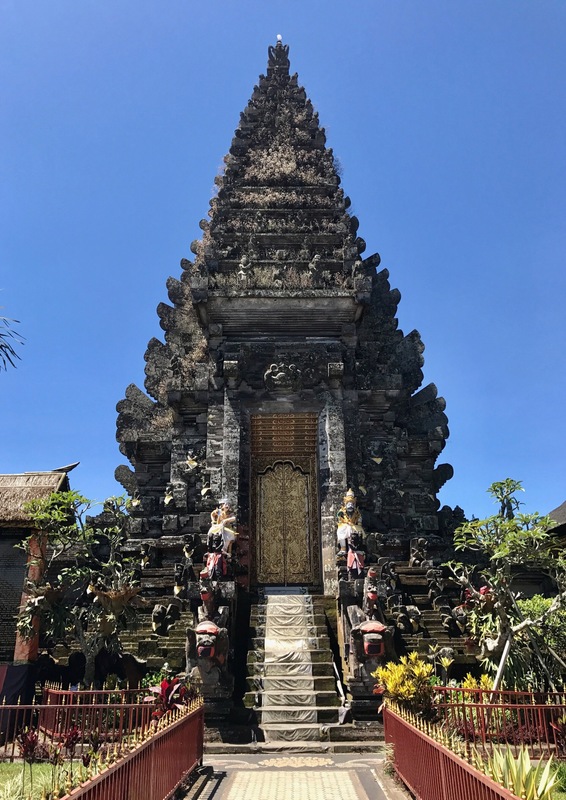 It was such a cool feeling being somewhere that was true, authentic Bali. At the end of the road is where I think the color green was invented. Sunset Point has the best seats for the nightly show. 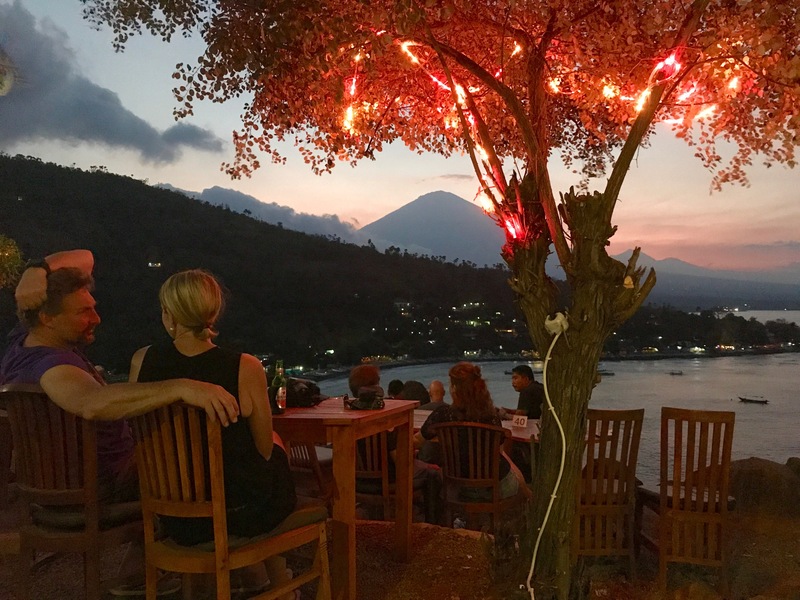 The ladies of my warung walked up the hill to enjoy a drink and the sunset. It was such a sweet view. 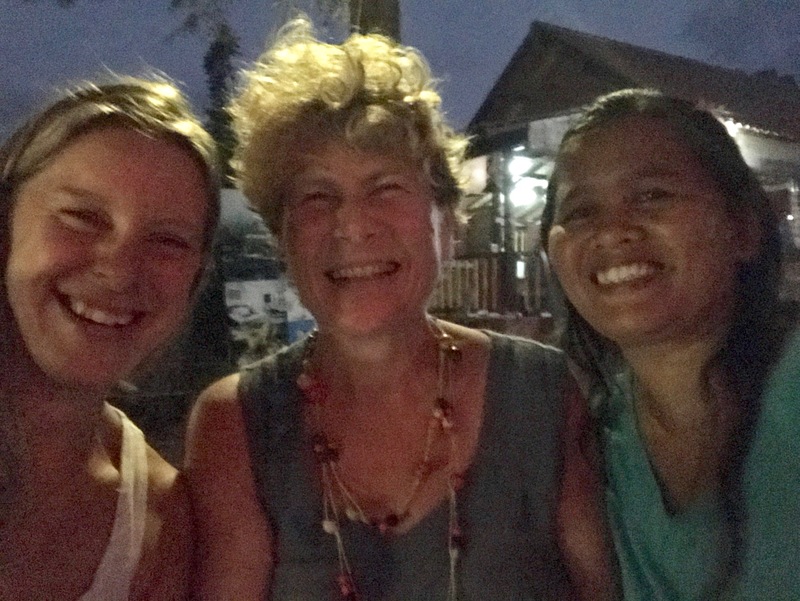 Everyone has nicknames in Bali and at our warung. Here we have Mo, Mom, and Mama. 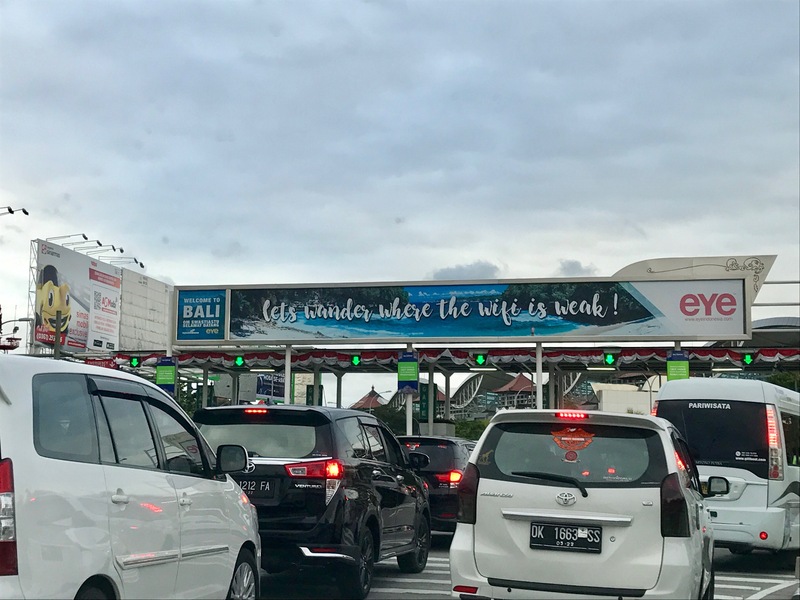 Months ago when I was telling people I was going to Bali, I heard the same phrase over and over again: “It’s your Eat, Pray, Love journey! !” Truth be told, I’d never read the book and I saw the movie when it first came out in 2009. It was a little surreal watching the movie while in Bali. It was so funny how my life paralleled this story, in a slightly different way. I’m sure it’s a common theme in many people’s lives. The cherry on top was having this cuddly kitty hang out with me during the movie. Love, love, love. 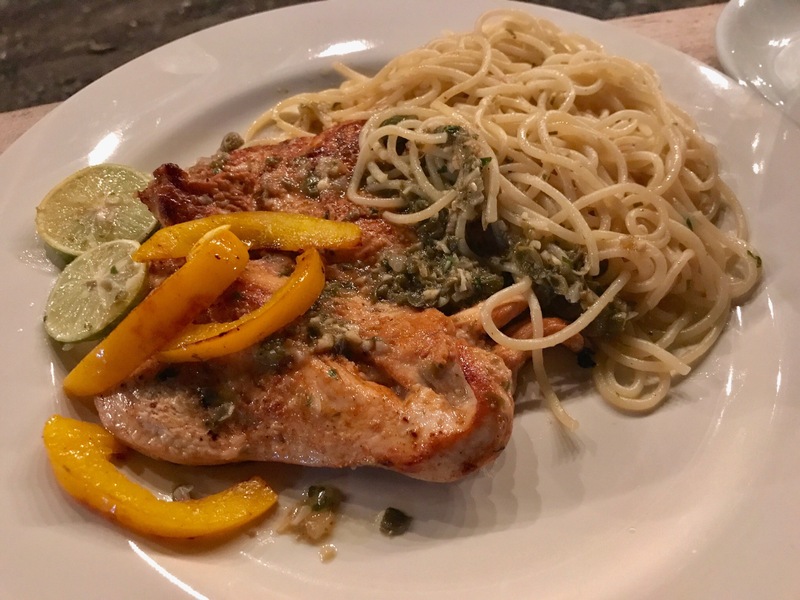 One of my all-time favorite meals is chicken piccata. When I saw it on a menu here, I immediately ordered it, but was kind of nervous about what would actually show up on my plate. You never really know what you’re going to get. Like when I ordered my first “burger” here…I wouldn’t have necessarily classified it as a burger. Much to my delight, the chicken piccata was AMAZING. And also, an addition to my list: “Things Cheaper Than a Starbucks Tall White Mocha” (about $5). 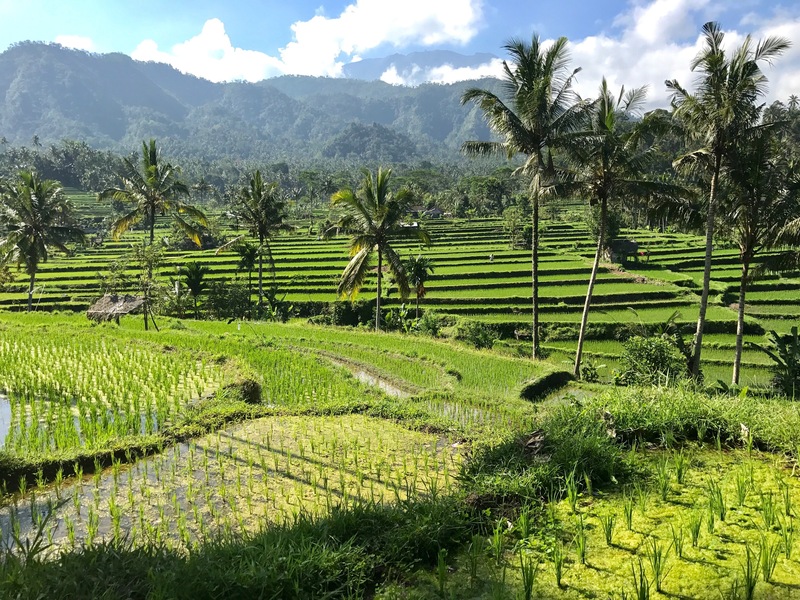 The thing is, after so many conversations with so many different Balinese locals, they all have a similar thought process. It’s all focused on happiness and no worries. 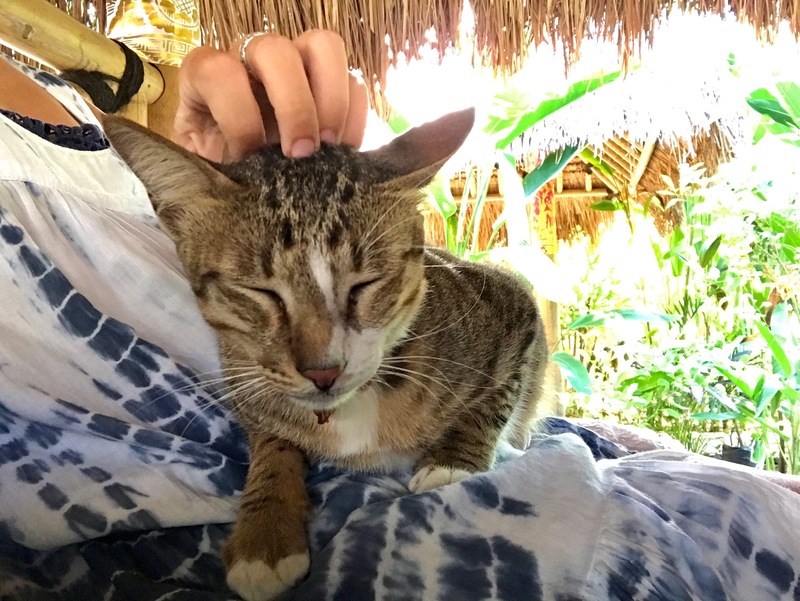 I’ve heard several Balinese say out of the blue: “Happy life!” I’d say they are smarter than they give themselves credit for. Yesterday, the wi-fi dropped for a good amount of time. It ended up being one of the most lazy, relaxing days I’ve had yet. I sat on the beach the majority of the day and snorkeled a few different times. I love going into the underwater world at different times because each chunk of the day brings new fish and new lighting. It’s absolutely incredible that some of the best snorkeling in the world is right outside of my home. I frequently swam to the underwater temple and watched all the different schools of fish. There are 4 large fish that all float in perfect alignment in front of the temple…it’s like they’re the guards. I loved diving down and being on the same level as them. As I stayed in the water longer, schools of these beautiful purple fish would all swarm around me. I loved feeling like a fish. I swam for so long that I completely lost track of time. I can’t remember the last time that has happened to me. Not knowing if it was noon or 4pm. Based on the sun’s placement, I was guessing 3pm or so. I decided to take a nap since a lot of my energy was drained (who knew relaxing and swimming could be so tiring?!). I woke up and remember thinking, “This is heavenly.” I grabbed my phone off my nightstand and took a picture of exactly how I woke up. I wanted a picture of my version of Heaven on Earth. ‘In the Wind’ by Lord Huron was on repeat as I zoned out. 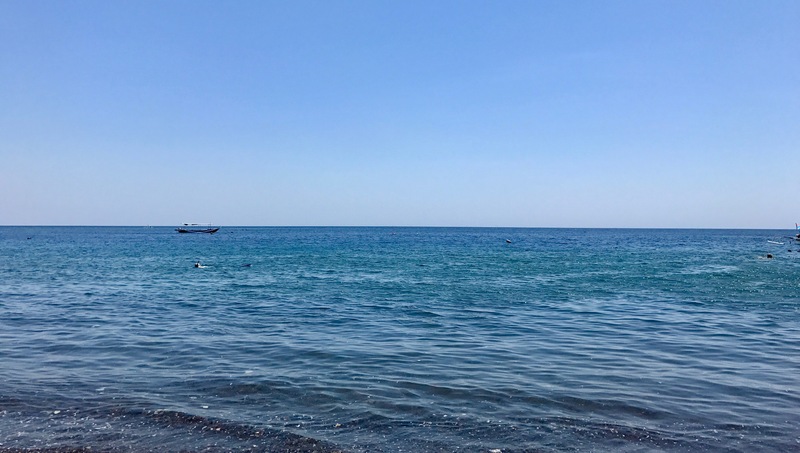 This song has some of my favorite harmonization and as I looked at the harmony between water and air, I took many deep breaths and felt complete relaxation. So I have a challenge for myself. I’m going to go 5 days with no technology. I’m going to put my phone on airplane mode and only use it for pictures and music. I want to go back to a time when all the answers weren’t at our fingertips. When we weren’t hunched over our phones, looking at minute-by-minute updates. 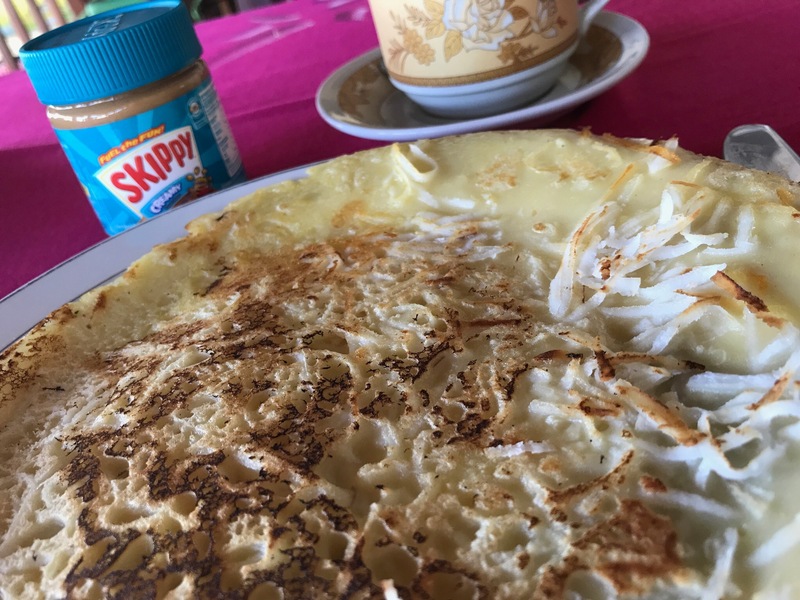 It was funny when I talked to my Mom about my little challenge, when we said goodbye, it was like this drawn out, “Ok, good luck…talk to you in a while.” It was funny that 5 days with no technology seemed like such a big deal. This shouldn’t be a big deal, but I don’t think I’ve gone 5 days unplugged since I was a child. One time in college, I did an assignment which was a day without any technology. It was such an abnormal thing to do that I was invited to do an interview on the radio about my experience. When was the last time you fully unplugged for an extended amount of time? 5 days doesn’t seem too long, but since time moves sooooo slowly here, it will feel much longer. I’m so excited for it.